Originally a graffiti artist spray-painting the walls of Bristol under the tag ‘Vermin’, Dale Marshall was sectioned in 1999 in one of Britain’s oldest asylums, St Lawrence’s Hospital in Cornwall. Walls with Wounds draws inspiration not only from graffiti and Marshall’s time at St Lawrence’s, but also from his studio, a former Victorian workhouse in North Wales, its decaying walls inscribed by children over 100 years ago. Each painting is inspired by a dramatic memory and represents a healing journey through physical destruction and repair. Marshall’s layered, multi-media works consist of a symbolic language of abstract expression and mark making. The result is a series of vibrant, powerful works documenting his personal journey from rebellion to rehabilitation. Dennis Isou is the pseudonym for the collaboration between recent graduate artists Mark Bleakley and Josh Wilson. The artist-duo, based in Newcastle, will be in resident at A3 Project Space during February as part of Connect/Exchange funded by Northern Film & Media. Their artist residency will culminate in a performance of ‘A Crack in the Window’, produced in collaboration with a regional actor and sound artist. 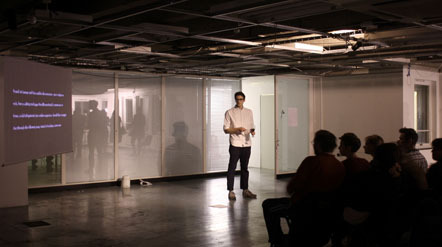 Through fictional writing, film, installation and performance. Their table top performance explores the act of ‘spectating’ and will pull the audience in and out of out of a trance-like state of immersive viewing. Talawa Theatre Company and the National Theatre take Errol John’s “bruising, brilliantly witty play” (Time Out) on tour after its critically acclaimed run in London in 2012. In Port of Spain, Trinidad, the snatches of calypso music, hymn tunes and drums are interrupted by the raucous celebrations of troops returning from war. Here, neighbours drink, bawl, make love, look out for each other and crave a better life. But Ephraim is no dreamer and nothing, not even the seductive Rosa, is going to stop him escaping his dead-end job for a fresh start in England. An audio described tour of A Big Bang: The Origins of the Pop Art Collection Part 1 for people with visual impairment. Free entry, drop in. A forum for anyone interested in making things together. Practice your craft and share skills and information with like-minded people. For everyone from beginners to experts. Please bring along your current project to the session. If you are a textile maker or simply interested in textiles, then the Textile Group is an excellent opportunity to meet like-minded people in a creative environment and swap knowledge and skills. Regular conversation club for people 50 years and over, offering a chance to relax and enjoy a chat about the topic of the month, supported by objects from the handling and reminiscence collections. New stories, new voices and new visions of the world. As The REP moves into the next phase in its remarkable history they are offering a new, yearlong development programme, REP Foundry, for emerging directors, writers, theatre makers and companies from across the West Midlands. The selected artists will present their work in progress at REP Foundry Nights. These scratch performance nights will provide a unique insight into how new theatre is formed and staged. Be the first to see work from REP Foundry artists throughout 2013. In the year 1609, brilliant scientist Galileo makes an astonishing discovery that will change the world. But as he sets out to prove that the earth moves around the sun he creates uproar and finds himself facing the wrath of the church. Enjoy an after-hours preview of the new exhibitions the BP Portrait Award 2013 (opens 1 March) and New Art West Midlands 2014. A not-to-be-missed introduction to the spring season at Wolverhampton. This entry was posted in Art, Birmingham, Exhibitions, Festivals, Performance, Theatre, Wolverhampton and tagged A3 Project Space, Bilston Craft Gallery, Birmingham Repertory Theatre, BP Portrait Award 2013, Craft Club, Foundry Night, New Art West Midlands, The Herbert, Wolverhampton Art Gallery. Bookmark the permalink.